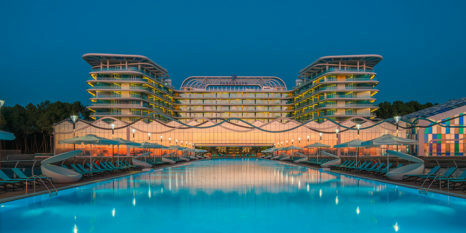 Shekvetili, Georgia, 2018-Apr-06 — /Travel PR News/ — Autograph Collection Hotels, Marriott International’s distinctive collection of passionately independent hotels has announced its debut in Georgia with the opening of Paragraph Resort & Spa in the Black Sea coastal resort of Shekvetili. The hotel joins the diverse and dynamic portfolio of Autograph Collection Hotels around the world – all independent, one-of-a-kind hotels that champion values of vision, design and craft. Nestled between the magnetic sand beaches of the Black Sea coast and an ancient pine forest, Paragraph Resort & Spa offers a unique array of features and exceptional meeting facilities, perfect for both leisure and corporate retreats. With a wealth of child-friendly facilities including kids club, cinema, zip line, bicycle trails and indoor aqua park, the hotel is also perfect for a family getaway. An outstanding feature of Paragraph Resort & Spa is its expansive public spaces, which range from the lobby’s walkthrough aquarium full of exotic marine life, to a majestic winter garden with indoor waterfall and aqua park. The jewel in the crown, however, is the 115m-long filtered seawater pool built into a panoramic deck leading out over the Black Sea. The 220 spacious bedrooms and suites feature distinguished design and luxurious furnishings, including ergonomically designed tubs and Roberto Cavalli amenities in the bathrooms. All rooms offer private balconies, many with spectacular views of the Black Sea coast. Guests are catered to at any time during their stay and will enjoy the hotel’s Lobby Bar, Winter Garden and all-day dining restaurant serving everything from breakfast to afternoon snacks and local delicacies for dinner. Sky Bar, located on the top floor of the hotel, offers a tailored menu of exotic drinks and expertly mixed cocktails to be enjoyed whilst soaking up the stunning 360⁰ views over both the surrounding coast and mountains. Paragraph Resort & Spa is perfectly equipped to host corporate events with a total of six rooms offering over 8500sqft of event space. The largest of these is the 5000sqft ballroom featuring an aquarium wall and winter garden view. Additional facilities include a 24-hour fitness centre and spa offering a wide range of treatments for both adults and children, plus steam room and plunge pool. Autograph Collection Hotels, part of Marriott International, Inc., celebrates individuality by curating one-of-a-kind travel experiences at 135 lifestyle hotels in nearly 30 countries and territories, among the world’s most desirable destinations. Exactly like nothing else, Autograph Collection properties are hand selected for their rich character and uncommon details. A personal realization of an individual founder’s vision, these hotels are defined by unique design, differentiated guest experiences and their meaningful role in locality. Autograph Collection Hotels is proud to participate in the industry’s award-winning loyalty program, Marriott Rewards® which includes The Ritz-Carlton Rewards®. Members can now link accounts with Starwood Preferred Guest® at members.marriott.com for instant elite status matching and unlimited points transfer. For more information, please visit www.autographhotels.com, and explore our social media channels on Instagram, Twitter, and Facebook to learn more about championing the independent spirit that is #ExactlyLikeNothingElse. This entry was posted in Hospitality, Hotels, Resorts, Travel, Travel Management, Travel Services, Travelers and tagged Autograph Collection Hotels, Black Sea, coastal resort, Jennifer Connell, John Licence, Paragraph Resort & Spa, Shekvetili. Bookmark the permalink.